The new versions of both IE (Ver.8) and Firefox (Ver. 3.5) comes with a really nice feature called Private browsing built in without any need of any special addon or configuration. “Private Browsing,” allows you to browse the Internet without Firefox retaining any of data about which sites and pages you have visited. 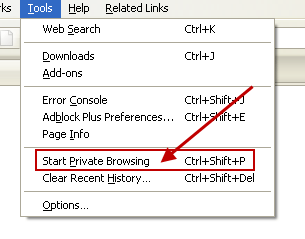 1.Go to Tools menu in Firefox and click Start Private Browsing. 2.Â After this, Firefox will warn you that it will save your current windows and tabs for after you finish using Private Browsing. Click on Start Private Browsing to continue. 3. After you click start private browsing, a new window will open which will tell you what firefox private browsing will do and it wont any information in your private browsing session. It also warns that even though firefox wont store any information during the session, still the Internet service provider or the employer (if you are on your office system) may track or store information related to your browsing session. Firefox window’s title will change to (Private Browsing) during yourÂ entire session. To end a Private Browsing session: go to Tools menu >>Stop Private Browsing entry. 1. 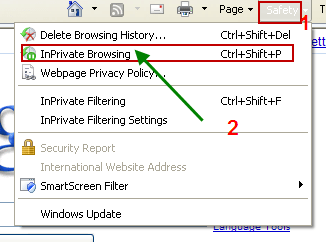 Go to Safety options in IE8 Menu and click “InPrivate Browsing” . 2. A new IE window will open which will tell you about private browsing. 3. That’s it. You can now browse privately. The private indicator in your browser will remain till you dont exit the session. To Close the private browsing session, just close the browser window. Great post, Avinash! Thanks for sharing these tips! Have you tried any of the IE8 demos yet? Check them out here: http://www.ie8demos.com/tryit/. thank you for the feedback and the links. I will take a look at them later on.